Fredericks presents 10 species that dwell in Northern California’s towering redwood forests. A northern spotted owl welcomes readers in an introductory “Dear Humans” note, explaining that by climbing the redwoods, scientists have discovered the rich complexity of animal life high in the canopy. From one “single soaring Eagle” to “ten spotted Ladybugs,” the species are depicted in their environments. “Six chattering Chipmunks” cavort upon a humus mat made of decomposing needles and other debris, while “seven busy Bumblebees” visit a huckleberry bush growing high above. The rhyming verses aren’t artful, but they successfully introduce Wallace’s detailed natural settings and the one-to-10 counting scheme. Each fourth line reads “And now comes number…”—providing predictability that a wide age range will find engaging. Wallace’s compositions depict the animals in varying niches in the huge tree. Three salamanders hunt insects in the shaggy bark, while eight bats roost in a dark hollow. 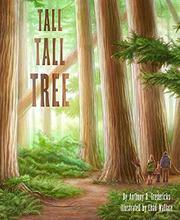 A final spread requires a quarter-turn of the book in order to marvel at the height and breadth of a redwood grove, where the white family from the cover appears, antlike, silhouetted below. The excellent aftermatter includes a section with facts and 10 additional animals to find. Pages for parents and teachers provide STEAM activities, websites, and more.